The systems of Yoga and Ayurveda invite many fascinating, detailed comparisons, but their ultimate and shared goal – to unfold the full potential of individual life in enlightenment – is often overlooked. This may be because achieving such a state is not considered practical or attainable for the average person today, or is thought to be a philosophical idea. However, new research in the fields of neuroscience, psychology, sociology and medicine offers ways to understand enlightenment and makes realizing this laudable goal of Ayurveda and Yoga a practical possibility today. However, recent studies from the fields of neuroscience, psychology, sociology and medicine show ways that allow to be able to detect this state of enlightenment. This is attaining enlightenment through Yoga and Ayurveda today a practical and desirable goal. 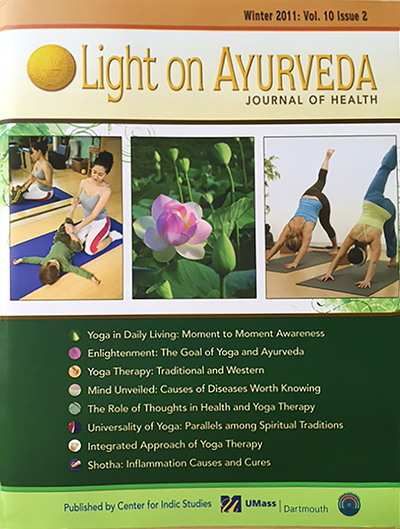 This article of Lothar Pirc, Dr. Karin Pirc and Dr. Jeremy Fields appeared as expert certified professional article in „Light on Ayurveda Journal, USA, Vol. X, Issue 1, Fall 2011“, published by the Center for Indic Studies University Massachusetts, Dartmouth. It highlights the opportunity to attain enlightenment, both from a practical and from a scientific perspective.